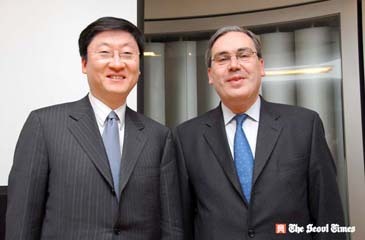 FKCCI President Philippe Li (left) and French Ambassador to Seoul Philippe Thiebaud poses for The Seoul Times. President Philippe Li of the French Korean Chamber of Commerce and Industry (FKCCI) in Seoul will hold FKCCI's Economic and Strategic Committee at the Invest Korea Plaza in Yeomgok-dong on March 13, 2007. The investment seminar, organized in cooperation with the KOTRA and the AFII (Agence Française pour les Investissements Internationaux: Invest in France Agency), will begin at 9:45 a.m. on the day and will last until 12: 30 p.m. It will be followed by buffet luncheon. French Ambassador to Seoul Philippe Thiebaud will attend the gathering. The topic of this gathering will be the Foreign Investment Attractiveness: Rethinking Foreign Investment Policy and Business Models. In today's globalized economy, it is essential for all the countries to attract foreign investments. Korea is now confronted to several factors like the rise of labor costs and a strong competition from neighboring countries, especially China, which may affect continuous investments by foreign investors. France , being the sixth largest economy in the world and dealing with the same constraints, has nevertheless managed to remain for quite a long time one of the most successful countries in the world in attracting foreign investments. In 2006, France was ranked number three in the world with a total amount of 88 bil. US dollars. Due to the recent changing economic circumstances, some French companies established in South Korea have decided to transform their business models and have been successful in doing so. Their example shows that it is possible to switch to new business models in South Korea. Mr. Philippe Favre, president of Invest in France Agency and Mr. Chung Tong-Soo, head of Invest Korea will describe the French and Korean foreign investment policies and recent advantages and benefits elaborated and offered to foreign investors. Mr. Lee Hae-Sun, vice president & chief marketing officer of Amore Pacific, will talk about the experience of Amore Pacific, as a foreign investor involved in an industrial activity in France. Mr. Jean-Francois Moreau, president of Anam Legrand and Mr. Serge Villatte, president of Rhodia Korea will explain why and how they have decided to change their business models in South Korea. The presentations will be followed by a debate about foreign investment attractiveness, respective merits of France and South Korea and how to provide with a suitable and flexible climate to foreign investors. FKCCI Economic and Strategic Committee aims at seeking ways to improve bilateral economic relations and thus creating opportunities to share views between top businessmen from the French and Korean communities. For participation, details or inquiries about the event, please contact Mrs. Carine Lebecque, FKCCI executive director or her assistant, Ms. Kim Su-Hee your availability at 02- 2268-9505, fax 02- 2268-9508, infos@fkcci.com).